Are you interested in building a career in Cyber Security? Come get the 411 on what you didn't get in school. This month's guest speaker is Tracy Avery. 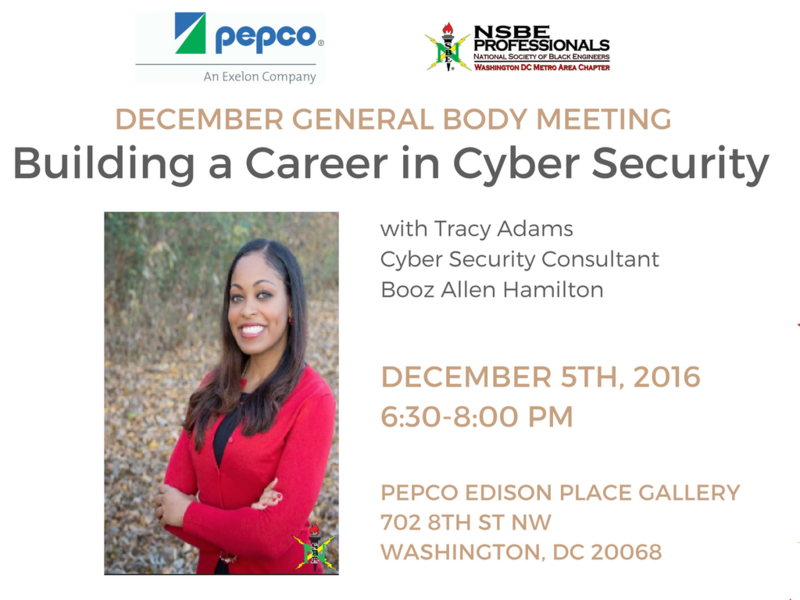 Tracy Adams Avery is an award-winning entrepreneur, Booz Allen Hamilton cyber security consultant, and STEM education for all advocate. She has been a consultant for several federal government clients in the cyber security policy, compliance and system testing capability areas. She has been responsible for providing solutions to improve federal systems’ performance by integrating security throughout the system and software development lifecycle process. In her most recent role at the Department of Energy, Tracy continues to cultivate strong client relationships and provide high quality cyber solutions to the agency. She is also leading strategic business development tasks geared towards sustaining a leading cyber pipeline within Booz Allen. Tracy currently serves as the Deputy Director of the National Society of Black Engineers (NSBE) Public Policy Special Interest Group (SIG) and as an advisory board member for Techbridge Girls.